Dismal conditions on the race course here forced lengthy postponements, and ultimately curtailed racing, on the second day of qualifying Round Robins at the 52nd Congressional Cup regatta, the second stage of the 2016 World Match Racing Tour. Despite rain and light, shifty breeze, PRO Randy Smith was able to sneak in two flights before winds deteriorated to null. And they were eventful races. Phil Robertson (NZL) tacked on two more wins to his tally, climbing to the top of the leaderboard. Meanwhile a tenacious Chris Steele (NZL) evened the score between his 36 Below Racing team, and Nicolai Sehested (DEN) in a match that saw boat speeds, at best, top three knots; and damp spinnakers hang limp. Sehested had entered the day undefeated; but “not invincible,” he implored. On the first leg of his match against Steele, Sehested rounded the top mark eight boat lengths ahead ... but in the fallow breeze, that eight boat lengths equated to 42 seconds. And by the time Sehested was on his second lap, that advantage had grown to nearly eight minutes. As the zephyrs waned and drizzle fell, PRO Smith called the races, and sailors retreated to the warmth and comfort of the host, Long Beach Yacht Club. 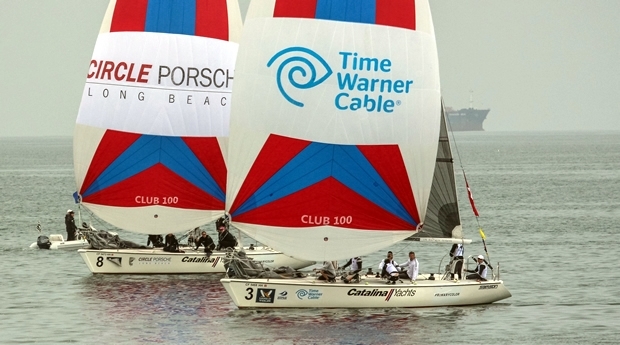 Racing will continue through Sunday April 10, in the waters off the Belmont Veterans Memorial Pier, in Long Beach; beginning at roughly 1130AM each day. With unsettled weather ahead, PRO Smith announced that at the conclusion of the Round Robins, a modified six-team repechage will be raced. If they are unable to pull off more than three flights, the repechage may be eliminated.